An exclusive, private experience for the residents of The Woodlands Country Club, Bentwater, Carlton Woods, Grogan's Point, Bender's Landing and Eastshore. For wine and food lovers, this is the not to be missed event. Period. June 3-9, 2019 is a celebration 15 years in the making, featuring wine and culinary tastemakers from across the globe. Wine & Food Week 2019 returns to The Woodlands for a week-long multi-faceted extravaganza, reuniting scores of culinary talent and winemakers. To celebrate, readers of Bentwater Life are invited to join esteemed vintner and cardiologist Madaiah Revana, M.D. for Prescription for Pinot, a private event from 6 to 7 p.m. prior to the Wine Rendezvous Grand Tasting & Chef Showcase. Dr. Revana will explore the health benefits of wine and offer tastings of selections from his Willamette Valley, Oregon Estate, Alexana Winery, and Mendoza, Argentina Estate, Corazon Del Sol of the Revana Wines Portfolio. Space is limited for this private event. Tickets are $125 per person, which include the pre-event with Dr. Revana and admission to the Wine Rendezvous Grand Tasting & Chef Showcase where guests enjoy demonstrations, 500+ wines and taste gourmet food from 60 restaurants. Accomplished Chefs from near and far are personally invited to showcase their talents and compete for The Goya Chef of Chefs Awards and $5,000 cash. During the week-long celebration experience national and international wines at wine tastings, dinners, Ladies of the Vine Luncheon, seminars, casual events like Sips, Suds & Tacos and the H-E-B Wine Walk at Market Street, all culminating in an elaborate Wine Rendezvous Grand Tasting. Wine & Food Week hosts over 100 chefs, hundreds of wines with well-versed industry representatives including Master Sommelier, Guy Stout, one of 215 Master Sommelier (MS) in the world and Tim Hanni, one of the first two resident Americans to successfully earn the title Master of Wine. The who’s who continues with special guests like: Wine Enthusiast Winemaker of the Year Adam Mettler of Michael David Winery; Former White House Chef John Moeller who authored Dining at the White House; Two-time Superbowl Champion, Wine Enthusiast and owner of Oceans 97, Jarvis Green; Bravo TV’s Top Chef contender, Ron Duprat; Screaming Eagle Executive Chef and Owner Erwin Husken; and TripAdvisor #1 Caribbean fine dining travelers choice, Chef and Owner Urwin Croes of The Kitchen Table by White, to name a few. 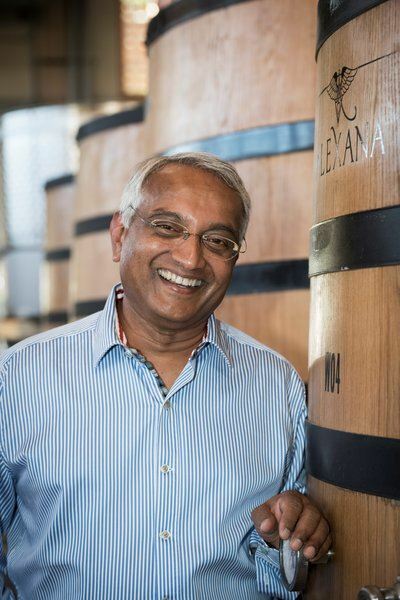 Dr. Madaiah Revana balances a successful practice as a cardiologist in Houston, Texas with his commitment to Revana Family Vineyard. His desire to take on an additional career making Cabernet Sauvignon is rooted in his love for both wine and the rich tradition and culture of winemaking. First introduced to fine wine by friends, he quickly became fascinated with Bordeaux’s first growths. That fascination led to the Cabernet Sauvignon-based wines of Napa Valley. Dr. Revana dedicated himself to learning all he could about his new interest. He traveled the wine regions of Europe and the United States, learning along the way, and he became determined to create a vineyard estate from which he could craft his own world-class wines. Revana Family Vineyard was born of that determination.